Brian Cosgrove and Mark Hall met at Granada Television in 1959, and founded Cosgrove Hall Films 20 years later. Without Cosgrove Hall, there would be no animation industry in Manchester today. 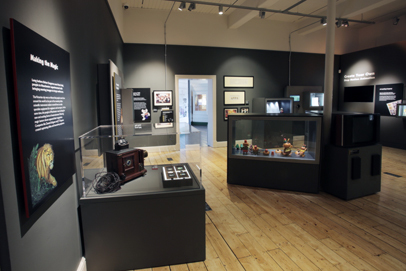 This exhibition brings together treasures from our archives alongside rarely seen objects from personal collections, to explore the development of the internationally renowned studio and its impact on the animation industry. Unfortunately the reality was, to put it mildly, underwhelming. After traipsing up and down various corridors in the otherwise usually excellent museum, we came to a tiny room which I supposed to be the ante-room to the main exhibition: about half a dozen models from fairly recent stop-frame animations such as Bill and Ben in glass cases, a few cells from hand drawn animations such as Danger Mouse in a couple of frames on the wall, and an old magic lantern in a case with a couple of slides. I had a good look at what was there –which took all of ten minutes and then went on through the door at the back of the room to see the ‘main’ part of the exhibition. “I must have come out the wrong door” I thought, evidencing the deductive prowess for which I am famed. So I tried another exit… and another… But whichever door I exited through, I was confronted by halls full of Reciprocating Grendel Thrutchers and Beam-Engined Frottle-Smashers*. there was no more animation memorabilia to be seen. Belatedly I realised that what I had thought was merely the ante-room to the animation exhibition was actually the entire exhibition. Well, colour me disappointed! As Alex quipped at the time “This just gives the impression that animation in the North West is not very important at all”. It also explained why none of the students we’d sent on ahead, about half an hour before we arrived at the museum were still in evidence when we got there. I can’t wait to hear their comments on Monday morning!